Master muralist Wayne Healy calls Isabel Rojas-Williams “La Reina de los murales,” but in reality she is more an ambassador or a madrina; making friends and building coalitions among artists, politicians, academics and arts supporters on behalf of public art. Her love of street art and murals began in the ’70s when she sprayed anti-government slogans on the walls of Pinochet’s Chile. She wrote her Masters’ thesis on the history of murals in Los Angeles and, unsurprisingly, gave birth to a muralist. Her son, former street artist Pablo Cristi, studied at the California College of the Arts and now teaches at the Oakland School for the Arts. 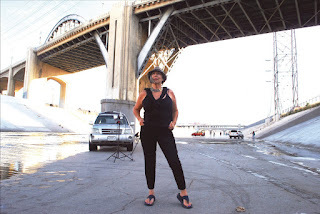 But her most significant role now, many believe, is her post as the Executive Director at the Mural Conservancy of Los Angeles (MCLA), where she leads an epic and long overdue mural restoration initiative. We met on a drizzly morning at her outdoor office—Nicole’s Cafe in South Pasadena, where she has been a regular since her student days at Cal State. After accepting a hug from the owner, who walked out to greet her the moment she arrived, we sat down to talk about her life and work. For her, the two are inseparable. Pancho Lipschitz: I know you received your M.A. in Art History from Cal State L.A. What was your thesis? Isabel Rojas-Williams: It’s about the Three Greats (Rivera, Siqueiros, Orozco) to Graffiti Art from the 1930s to the 2000s. But my interest in murals goes back to Chile where I was born. I was a law student at the time that Allende was in the government, and then we had a coup d’etat. So at the time, many people like me were writing political slogans on the walls. It was the only way. We didn’t have access to TV or newspapers or radio so the only way that we could express ourselves was that. In 1973, I was forced out of my country, and I was dropped into Highland Park. I was very alone here, I didn’t have any friends, my English was very limited, I was lost in a big city. But I saw the birth of the Chicano Mural Movement. I saw David Botello and John Valadez and all those people. When Estrada Courts was happening I saw the murals being painted and I knew about all of the artists, Willie Herron, Barbara Carrasco, Judith Hernández. I found myself when I saw those murals being created. I realized that my history was the history of millions. People ask me “what do you do?” I’m an art historian but in reality I’m a social activist who uses art history as a tool of empowerment to express my ideas. You don’t have a choice. I applied for visas to different countries; Mexico, Germany, Cuba and United States. The United States was the first one to grant a visa for me. So the country that backed the coup de etat was the one that granted you a visa? And how did you get involved with the Mural Conservancy of Los Angeles? When I was a student at Cal State L.A., I was very involved with the muralists and the graffiti artists because my son became a graffiti artist. He was painting graffiti pieces in East Los Angeles. I was very afraid of that. I didn’t understand it. I took him, before he was able to drive, to the yards where he was painting and I was hiding in a corner because he was embarrassed of me being there. But I learned the importance of freedom of expression. It was through his eyes that I fell in love with the public art of Los Angeles. So then when I went to Cal State L.A. I knew all the younger generation of graffiti artists through my son. And then they invited me to teach there. So I invited all the artists you probably can think of to talk to my classes and the graffiti artists. I invited the graffiti artists to do demos to my M.F.A. students. So MCLA invited me to come and see if I wanted to work for them. For people who don’t know, how did the mural ban come about? In the late ’80s and ’90s there was a proliferation of signs, and the city did not distinguish between commercial signs and murals. The sign companies decided to sue the city to have more walls. So the city decided to do the Solomonic decision in 2002. “Okay, no more murals, no more signs: mural moratorium.” I said how is that possible? I was kicked out of my country for this very reason. I came to the big democracy, and here, the muralists don’t have rights to express themselves on the walls. So to me. it was very personal. The thing is that I was very naive and very idealistic about ‘we can do it’ and I talked to Man One and I told him between the two of us, you know a lot of people, I know a lot of people. I began introducing Tanner Blackman, who was the city planner at the time, to half of the city. And he’s so great, that he met the other half on his own. I began talking to people in the streets across from LACMA about what was happening and how unfair this was. And I began connecting with the galleries and museums and universities and colleges and we began connecting with the muralists. I met with the city officials, the city council members almost on a daily basis from 2011 until September, 2013 (when) Mayor Garcetti signed the mural ordinance. Now the muralists can paint legally, and that’s what’s causing this mural renaissance. What are the elements of a successful mural? Community involvement. If you really want to leave a legacy, get involved with the community, present your sketch, invite the locals schools and the youth to help design a sketch that should be included in the mural. Connect with the local politicians, connect with local newspapers, open a Facebook page, Instagram, Twitter, to show the progress. Continue to invite the neighbors, invite the passersby to paint. Tell them, ‘You want a brush? Here, paint this yellow, blue’ whatever... Invite the little kids, that’s how you give a sense of ownership. That’s the best way to create and preserve a mural. What’s up next for MCLA? Our mission is to restore, preserve and document the murals of Los Angeles. In the restoration part, we are ready to go on Eloy Torrez’ Pope of Broadway mural. We are restoring the Willie Herrón and Gronk Moratorium mural at Estrada Courts. Then, we are restoring Judith Hernández’ [work] at Ramona Gardens. In 2016, we will again participate in the Los Angeles Art Show. We’ll have a booth where we will have an exhibition of muralists that also do canvas work. We’ll have a panel discussion about the mural renaissance and the explosion of murals in our city. At Cal State L.A., we were the first ones to do an exhibition about the murals of L.A. We had 700 people on opening night and 7,000 people saw the show. After that, UCLA did something and now mural art has walked into the museums and the galleries, and everyone wants to come over and paint murals. Murals are hot! For more information on MCLA or to sign up for a mural tour, visit www.muralconservancy.org. Intrepid Brooklyn & Boyle (@brooklynboyle) art mole Pancho Lipschitz, (@pancho_lipschitz), is a leading barrio flaneur and barrio flan connoisseur.